One of the things that sets the Divergent society apart from other dystopian societies featured in popular young adult novels is the faction division. In Veronica Roth's popular series, the city of Chicago is divided into five factions, which determine how people live their lives. Shailene Woodley will play the lead character Tris Prior in Summit's adaptation of the story, which begins with her learning which faction she's most suited for and then facing the choice to either stay with her family's faction, or choose another. Of course, the twist there is that she learns she's "Divergent," which means she won't fit into any one faction. Earlier this week, we got a look at the Dauntless faction symbol, a circle of flames. 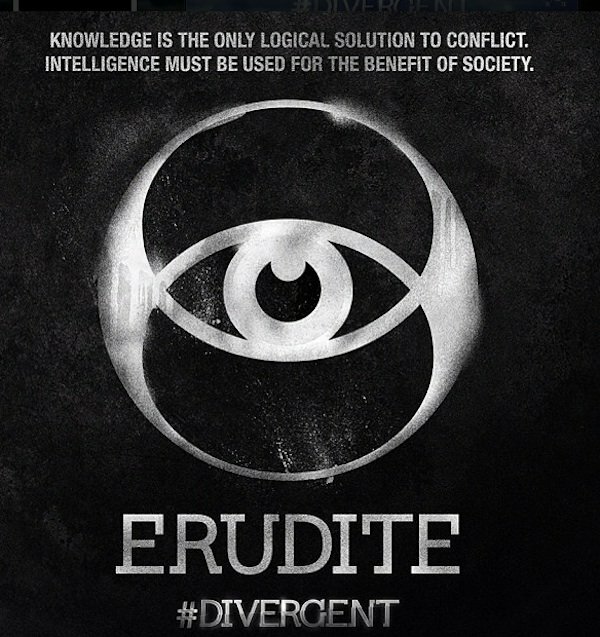 And now the other four faction symbols have been revealed on the Divergent Instagram. Each of them includes a faction credo, which emphasizes how this society is divided. Did anyone else read that with the voice of one of Doctor Who's Daleks? The very practical and borderline robotic tone of the credo captures the Erudite's appreciation for logic above all else. The eye symbol is a little creepy. 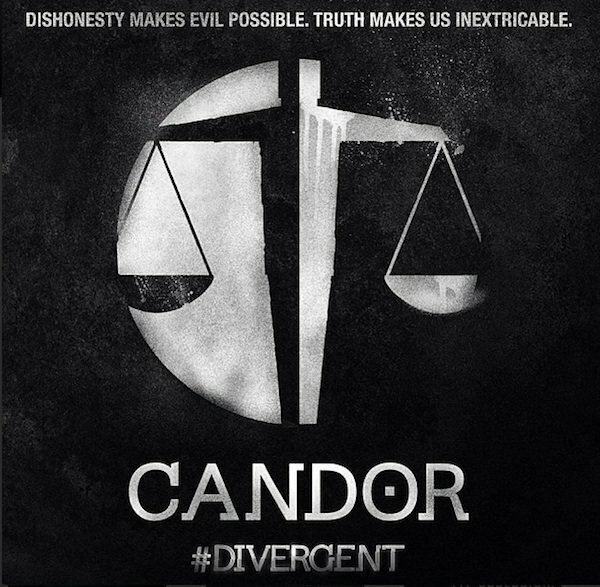 Next up, we have Candor, known for their bluntness and…well, candor. Disonesty makes evil possible. Truth makes us inextricable. There's a justice-vibe with this one as we see a set of scales and a human-like figure holding them at even levels. An unlikely Facebook status if ever there was one. The symbol is two hands clasped, which signifies the factions known willingness to put others before themselves and help people whenever possible. 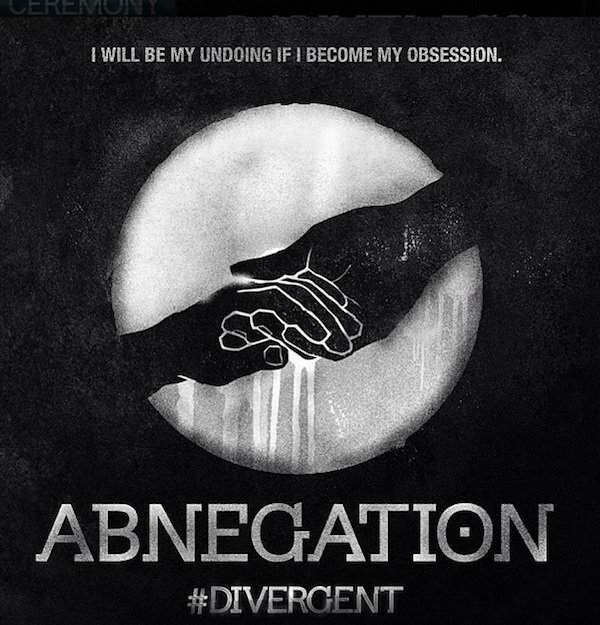 Tris' parents are Abnegation, therefore she and her brother were raised that way too. Not only are they known to be selfless, but they also like grey clothing, which explains Shailene Woodley's get-up in the last production photo we saw. 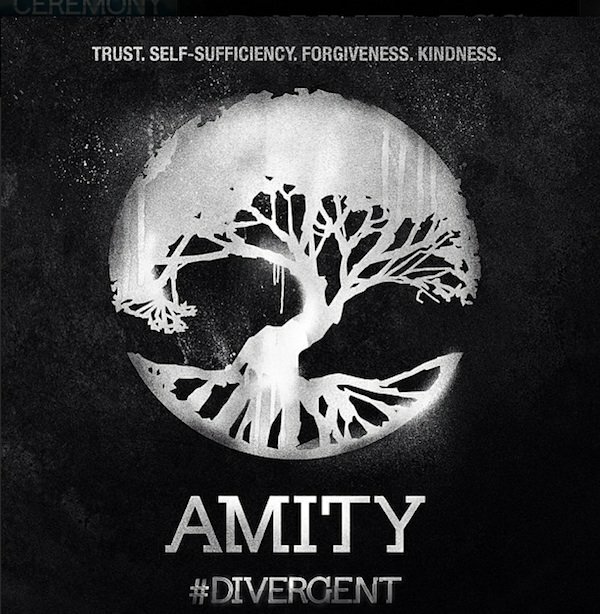 Finally, we have Amity, the nice faction. Because they're nice. Amity people are known to get along. And their symbol is apparently a tree, which may be symbolic of all of the roots working together to provide strength among their faction. Or it's just a symbol of peacefulness. See the Dauntless symbol here. While another production photo would be great, it's fun to see the movie versions of the faction symbols, and not all that different from Summit's choice to release the Army logos for Ender's Game. Divergent arrives in theaters March 21, 2014, so we have plenty of time to anticipate the film, and fans are likely also counting down the days until the third book in the series, Allegiant, hits shelves.